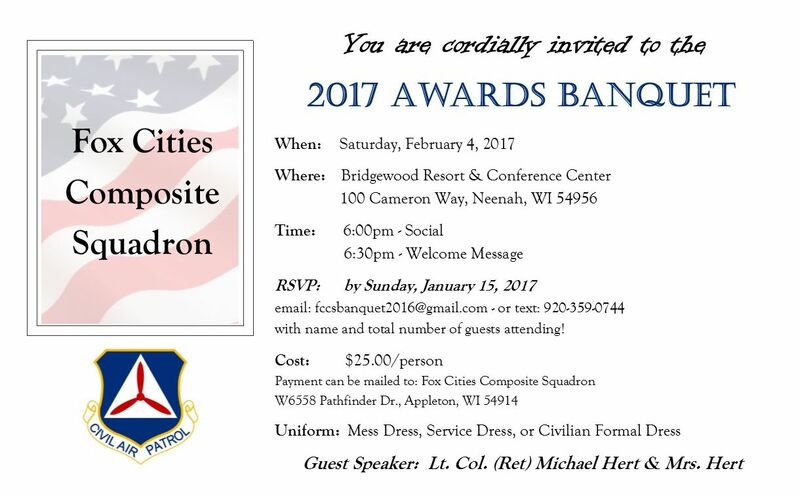 Fox Cities Composite Squadron has dove right into the new year with excitement and just like that January is already nearing an end?! As they say … time flies when you are having fun! Just a reminder that tonight (Tuesday, January 24th) is our regular weekly meeting! If you’ve been interested in finding out more about Civil Air Patrol we would love to see you! We would like to Thank everyone who supported our Buffalo Wild Wings Fundraiser on January 19th! It was a great night and we seen lots of familiar faces! Many of you may not realize but Civil Air Patrol is an all volunteer program and is a 501c3, our Squadron runs off of donations and fundraisers so these type of events, while fun, are essential to being able to continue our training through-out the year! With that said it is never to early to mark your Calendars for our next ‘FUN’draiser! Thursday, May 11, 2017 we have a fun night out at BadgerSports Park planned! This fundraiser will be similar as all you have to do is come out, buy a wristband and HAVE FUN! Go ahead … pull out your phone and put it on your Calendar! Who doesn’t love laser tag and batting cages?? Long before we get to May 11th however, we will have our Annual Squadron Banquet! There is still a small window of time to sign up! This event is open to any and all, no membership needed! Our guest Speaker this year is Lt Col (Ret) Michael Hert and Mrs. Hert, and they will be sharing their exciting and difficult journey as a military family. So if your calendar is empty for Saturday, February 4, 2017 … we have a great way to fill up your evening! Good food, great friends, and a night out! If you are interested in signing up please do so quickly as our numbers need to be in soon!! RSVP HERE!. Stay tuned as the excitement level of upcoming Spring events start to bloom! Ok, well, we can hope for Spring in February, right? ?